The photos below were taken in July 2003 by Chuck Clark from Tikaboo Peak. Special thanks to Chuck for sharing the photos with our readers! This panorama shows the two large new fuel tanks at the south end of the base, and the new taxiway. Both the fuel tanks and the new taxiway were constructed in early 2003. The new taxiway is 4625 ft. long and 125 ft. wide, and connects the southern ramp area with the northern section of runway 14L/32R. This provides a convenient shortcut for Janets, which usually land on 14L and take off on 32R. 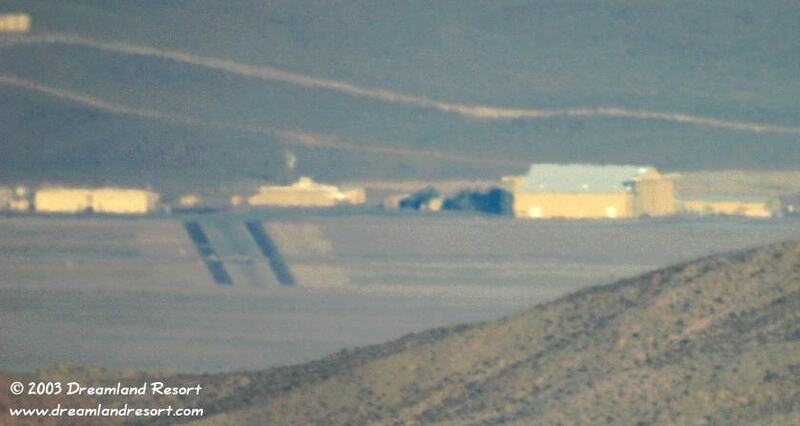 The Janet ramp is just behind the foothills to the right of the large Hangar 18. Click image to enlarge. This closeup of the new taxiway shows that the construction is nearly finished. Chuck observed a smaller vehicle going back and forth on it, possibly finishing the surface. The older runway 14R/32L can be seen crossing the taxiway near its center. The intersection with the newer runway 14L/32R is out of sight.